You are here: Home>FAQ>What Is Color Rendering Index (CRI)? Color rendering describes how a light source makes the color of an object appear to human eyes and how well subtle variations in color shades are revealed. The Color Rendering Index (CRI) is a scale from 0 to 100 percent indicating how accurate a "given" light source is at rendering color when compared to a "reference" light source. 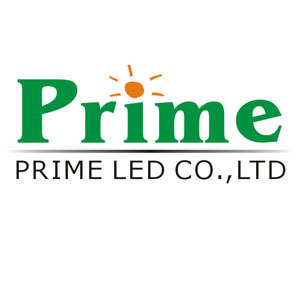 The higher the CRI, the better the color rendering ability. 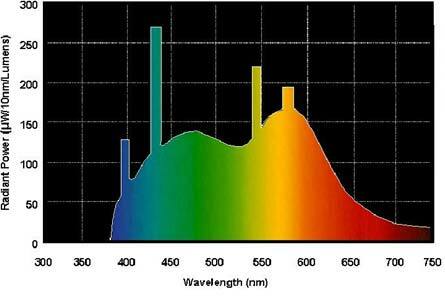 Light sources with a CRI of 85 to 90 are considered good at color rendering. Light sources with a CRI of 90 or higher are excellent at color rendering and should be used for tasks requiring the most accurate color discrimination. It is important to note that CRI is independent of color temperature (see discussion of color temperature). Examples: A 2700K ("warm") color temperature incandescent light source has a CRI of 100. One 5000K ("daylight") color temperature fluorescent light source has a CRI of 75 and another with the same color temperature has a CRI of 90. The visible part of the electromagnetic spectrum is composed of radiation with wavelengths from approximately 400 to 750 nanometers. The blue part of the visible spectrum is the shorter wavelength and the red part is the longer wavelength with all color gradations in between. 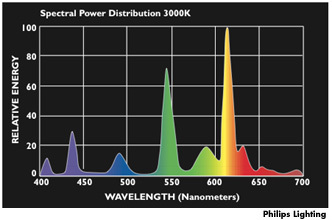 Spectral power distribution graphs show the relative power of wavelengths across the visible spectrum for a given light source. These graphs also reveal the ability of a light source to render all, or, selected colors. Below see how a typical spectral power distribution graph for daylight. Notice the strong presence (high relative power) of ALL wavelengths (or the "full color spectrum"). Daylight provides the highest level of color rendering across the spectrum. Compare the daylight spectral power distribution with that for a particular fluorescent lamp. The most obvious difference is the generally lower level of relative power compared to daylight - - except for a few spikes. All wavelengths (the "full spectrum) are again present but only certain wavelengths (the spikes) are strongly present. These spikes indicate which parts of the color spectrum will be emphasized in the rendering of color for objects illuminated by the light source. This lamp has a 3000K color temperature and a CRI of 82. It produces a light that is perceived as "warmer" than daylight (3000K vs. 5000K). It's ability to render color across the spectrum is not bad, but certainly much worse than daylight. Notice the deep troughs where the curve almost reaches zero relative power at certain wavelengths. Here is another fluorescent lamp. 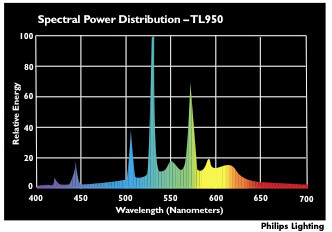 This spectral power distribution looks generally similar to the one above except it shows more power at the blue end of the spectrum and less at the red end. Also, there are no low points in the curve that come close to zero power. This lamp has a 5000K color temperature and a CRI of 98. It produces light that is perceived as bluish white (similar to daylight) and it does an excellent job of rendering colors across the spectrum. If you want a high color rendering bulb to produce light perceived as warm white, choose a bulb with a color temperature of 3000K or 3500K. If you want a high color rendering bulb to produce light perceived as white, choose a bulb with a color temperature of 4000K. For a bulb that simulates daylight, choose a color temperature of 5000K or higher. Previous:	What is IP Rating's?